The NBA 2K League might be your best shot to be a professional athlete. The Crossover takes you inside the inaugural draft and what the future may hold for the NBA's latest gamble. The NBA believes you—yes you!—can be a professional athlete. Even if you, like me, eat an ungodly amount of bacon for breakfast when you’re roommates aren’t home, if your idea of exercise is walking to a bagel shop, you too can be a professional athlete—as long as you’re one of the best NBA 2K players in the world. 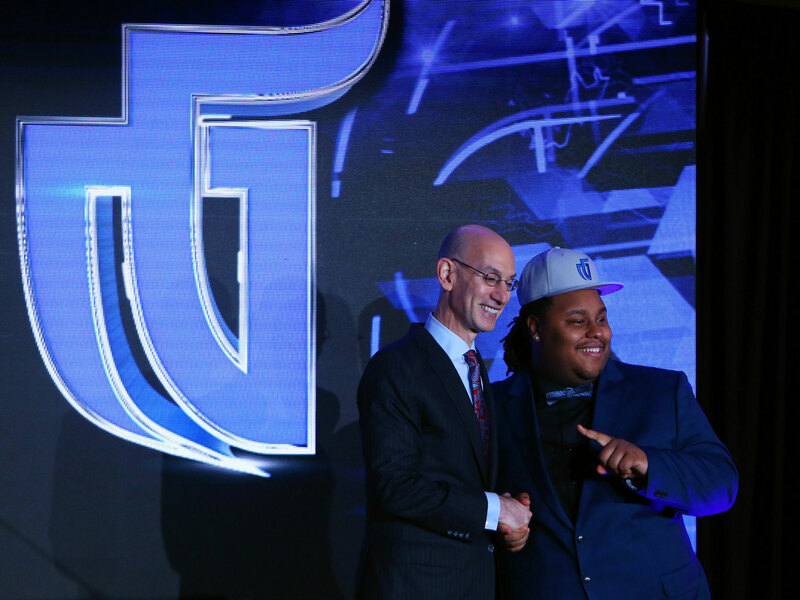 That was one of many eye-opening statements made by commissioner Adam Silver on Wednesday, as the NBA held the draft for the inaugural season of its 2K League, the first of esports league of its kind for a professional sport. For the uninitiated, the NBA 2KLeague is an esports league sponsored by the NBA, featuring the top 102 NBA 2K players in the world. Seventeen NBA franchises are sponsoring squads in the league, each with six players who will control created avatars. Remember those sleepovers you had as a kid when you played MarioParty all night? It’s like that, raised up a 1,000 notches. Each game will have 10 user-controlled players on the court, with an opportunity to bring someone off the bench. And when the champion is ultimately crowned, the prize money will be $1,000,000. Games will be aired for people like you and me to watch—just like real NBA games—and before you scoff, Strauss Zelnick, the CEO of Take-Two (the company that makes 2K), touted Wednesday that 200 million people consider themselves avid viewers of esports. Basically, there’s already a large community of people watching other people play video games, and don’t be surprised if the 2K League immediately starts drawing larger numbers than G League games. The draft was certainly treated like a professional event. Draftees—the gamers—were decked out in Express suits they picked out the day before. Silver announced the first pick, but only after it was already tweeted out by Woj. WNBA legend Swin Cash was analyzing the selections for NBA TV. Family and friends hooted and hollered as their loved ones had their names called. And in post-pick interviews the draftees spoke in platitudes often reserved for lottery picks, shouting out their moms and repeatedly reminding everyone how blessed they are. It was kind of surreal to watch the No. 1 overall pick of the draft—Artreyo Boyd—dap up Silver like he was Marvin Bagley, but it’s certainly hard to blame the players for being excited. The draft was taken equally seriously by the teams conducting them. Seventy-two thousand players qualified for the initial pool of draftees, and that number was whittled down to 102 through increasingly difficult to reach benchmarks, as well as the help of a third-party analytics firm. The 17 teams were given dossiers on each of the players, with information ranging from their stats to their charisma. GMs were allowed to interview players to determine how they would fit within the franchise, and one GM told me his team had to have several contingency plans in place for the draft because no one knew how the picks would go. The 2K league seems fairly lucrative for the players. They’ll make between $32-35,000 for six months of work, with housing, meals and relocation expenses provided by the team. (Each team of six players will be living together Real World-style in the city of the team they were drafted in.) The season starts in May, and the franchises will hold a training camp of sorts in the two weeks prior to get their players acclimated to one another. If all of this sounds silly, that’s because it kind of is. It’s video games! It’s people getting paid to play video games! And the NBA is expecting us to watch! But the truth is, esports has been and will be popular whether or not traditionalists thumb their noses at it. The audience is already there, and the potential revenue stream—and the potential to bring in new fans—makes the 2K League an obvious gamble for the NBA. At the very least, all those kids playing 2K instead of real basketball now have just as much reason to devote all the time they want to their craft. The 2K League may be their, yours and my best chance to become a professional athlete.